This Spicy Chimichurri Chickpea Pasta Bowl is super flavorful, healthy, easy to make, gluten- free, vegan, and packed with protein and fiber! This delicious and healthy gluten-free vegan pasta dish can be served as a warm bit of comfort food, or as a cold pasta salad . . . I love a good bowl of pasta! And, I was feeling a bit tired of my usual go-tos when I created this dish. I was looking for a different pop of flavor, and I think I succeeded . . .
We truly enjoyed the medley of flavors and textures in this Spicy Chimichurri Chickpea Pasta Bowl, and we hope you do, too! Preheat oven to 400°F.In a large bowl combine chickpeas, sriracha (or hot sauce), and olive oil. Toss until chickpeas are evenly coated.Pour chickpeas into an even layer on a cookie sheet.Roast for 20-25 minutes, tossing halfway through, until beginning to darken and sufficiently crispy.Cook pasta according package directions. Drain and set aside.Make (or buy) your preferred chimichurri sauce (my recipe can be found below! 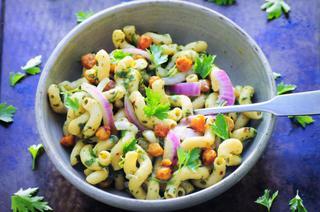 ).To serve warm: In a pot over low heat combine cooked pasta, chimichurri sauce, red onion, red chili flakes. Salt to taste. Lightly toss until heated throughout. Top with chickpeas right before serving.To serve as a cold pasta salad: In a large bowl combine cooked pasta, chimichurri sauce, red onions, red chili flakes. Toss to combine. Salt to taste. Fold in crispy chickpeas. Cover and refrigerate for at least two hours before serving.Optionally garnished with chopped fresh parsley before serving.Enjoy!